Discover what’s new and what’s developing at this unique convergence of U.S. and international shoulder and elbow surgeons. Lectures, panel discussions, video demonstrations and case discussions engage you in the latest surgical techniques, managing and avoiding complications, and point/counterpoint debates on current controversies. Evaluate current treatments and practical solutions for instability, rotator cuff deficiency, arthritis, and traumatic injuries to the shoulder and elbow. Ask in-session questions via e-moderators throughout the course and bring your tough cases for one-on-one discussion time with faculty. 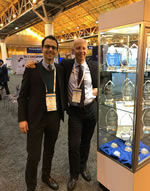 The Academy would like to thank the American Shoulder and Elbow Surgeons for the many contributions made by its members in the presentation of this program. The Academy and orthopaedic specialty societies work together to provide orthopaedic surgeons with the highest quality educational programs and publications. This cooperative spirit among colleague organizations is an important resource and valuable asset for the orthopaedic community. Your syllabus will be provided in electronic format only. Registrants will be notified of details on downloading the file in advance of the course.